Halloween – It’s the Costumes and Decor that make it So Much Fun! I love Halloween. There. I said it! I have loved it since I was a small child and dressed in goofy outfits racing from house to house to fill my pillowcase with tons of candy. What a funny ‘tradition’. The weeks of planning what to wear almost became as exciting as the actual event of wearing the final chosen costume. As I got older it didn’t get any less exciting for me and in fact, it not only was about the costumes and candy anymore, it was about the decorating and party planning. It’s truly a great day when I can retrieve my bins (yes I said BINS with an ‘s’) of Halloween decorations out of storage in early October and start carefully placing all the eerie pieces in their special places. What is it about taping spiders, webs and goulish shadowy figures on the insides of my windows to lend to a haunted house feel for those adorable innocent little trick or treaters that is just SO MUCH FUN! Yes,,,I put tomb stones in my flower beds and drape sticky webs over my shrubs. I have ghosts hanging from now orange glowing porch lights and the most creepy scary music I can find to play outdoors on the eve of Halloween through a slightly open garage door. Inside I have multitudes of spiders, worms, skeleton bones and skulls strewn over tables lit with soft flickering candle light at night. My dining room takes on an ‘Adam’s Family’/ ‘Munsters’ feel with black crows on my chandelier, more webs, black candelabra on the table with torn muslin and spidery serving trays awaiting the jellied brain and blood (raspberry jam) soaked finger tip cookies. Witch’s hands are placed here and there, creeping out from unsuspecting spots. Black cats with their backs arched and hair on end are perched high on cupboards looking like they’re ready to pounce. Small rubber mice peer around corners and sit on gourds and mini pumpkins on my mantle. And.. of course… don’t forget the mannequins dressed in various outfits looking like they’re sneaking around corners where you least expect. 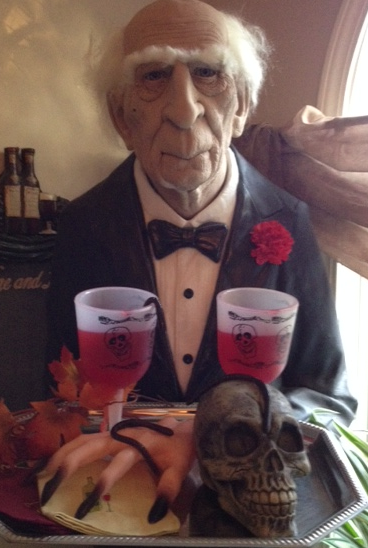 Even Jeeves our butler (yes…that’s right) is ready for service with blood filled goblets. With dark dingy pictures of fake relatives now hung on my walls, eyes following you as you walk by, and various decorative signs saying ‘This way to the Asylum’ my decorating is complete. I think sometimes my family and friends wonder if I’m a bit nuts when they come to my home in October. Along with all the wacky Halloween decor, I have racks of costumes both bought and handmade as well as drawers of various wigs waiting for the choosing. Life for me is about having fun and keeping things interesting and what better event to let your creative side run wild than Halloween. I think it’s time to have a party! Happy Party Planning from Eventastic!